It was a brilliant start to the week for the club, with City’s men and women’s teams competing in their FAI Cup finals on Sunday. City celebrate winning the U17 National League. THE GOOD TIMES rolled on for Cork City on Monday evening, as the club were crowned SSE Airtricity League U17 champions for 2017 after defeating Bohemians on penalties. The title was clinched in front of their own supporters at Turner’s Cross just three days after the club’s senior team hoisted the Premier Division on the very same pitch for the first time since 2005. Opponents Bohemians were riding high heading into Monday’s final. The Gypsies turned a two goal deficit around to beat Waterford 4-3 in their semi-final last week, with the club’s U19 side also reaching their league final this Wednesday’s against St Pat’s. However City and the visitors from the capital could not be separated after 120 minutes which saw neither side break the deadlock following extra time. Penalties would pick a winner and, with a number of current City players as well as manager John Caulfield watching on from the stands, the home side prevailed 4-2 on spot kicks. The success only adds to what could prove a tremendous fortnight for the club. Caulfield’s senior side lifted the Premier Division following a 1-0 win against Bray Wanderers on Friday night, after mathematically securing the title a week before against Derry City. His side will be aiming to complete a first ever double in the club’s history when they take on Dundalk in Sunday’s FAI Cup final. 📸 Great to see a number of the @CorkCityFC players support the next generation at the U17 Final! An extra-time winner from Sean Maguire brought the Cup back to Leeside last season, with Stephen Kenny’s Lilywhites aiming for revenge after relinquishing the league title for the first time since 2013. Two City sides will take the field at the Aviva Stadium on Sunday, with Cork City WFC taking on UCD Waves in this year’s Women’s FAI Cup final. The Rebel Army beat 2016 finalists Wexford Youths ten days ago, with Sunday’s decider a first ever Women’s FAI Cup in both clubs’ history. Email “Success continues for Cork City as club clinches League of Ireland U17 title on penalties”. 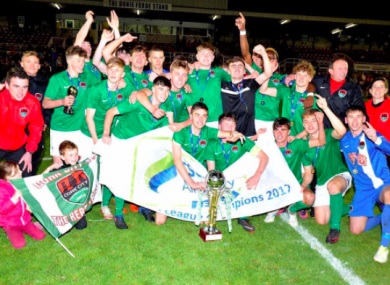 Feedback on “Success continues for Cork City as club clinches League of Ireland U17 title on penalties”.